Forty Butler students are taking their psychology research on the road to the Association for Psychological Science (APS) national convention May 22–25 in in San Francisco. From left, Beth McGlone, Karina Hamamouche, and Emily Lauth with their poster for the Association for Psychological Science convention. Accompanied by seven faculty members, the students will present posters at the conference, describing research they’ve conducted at Butler. They will also hear about cutting-edge science and rub elbows with leading psychology authors and scholars. 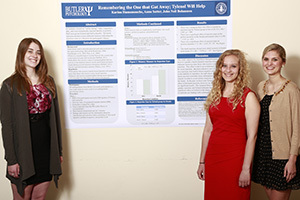 For the third consecutive year, Butler is among the top five schools in the number of students presenting posters during the conference, and the only private school in the 2014 top five. University faculty and students make up about 87 percent of the 4,500 expected attendees; representatives of government agencies, non-profits, and research institutes and businesses will also be on hand. Many of the Psychology faculty take students to national and regional conferences annually, and often use some of their research grant funds to help defer student expenses to attend conferences, Dale said. Butler’s Office of the Provost has paid some of the students’ travel costs for the APS conference. APS will host 17 poster sessions in San Francisco, featuring an average of 130 posters each. Faculty coach their students on their presentations, and guide them in creating the 4-foot-by-8-foot posters that detail their research methodology and findings. But the mentors will let the students do the talking during the 90-minute poster sessions, when other conference goers look over the work and ask questions. Throughout her undergraduate years, Hamamouche researched memory with Professor Neil Bohannon. In San Francisco, she and sophomores Beth McGlone and Emily Lauth will present a poster on their study of cognitive psychology, memory, and social rejections. 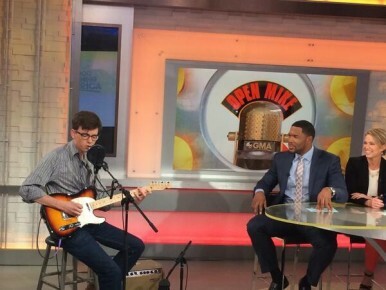 At his first APS conference, senior Ian Katz of Buffalo Grove, Illinois, will present a poster on “The Ebb and Flow of Performance Feedback,” He and classmate Chris Thompson worked on the research with Assistant Professor Alison O’Malley ’04. “A lot of people we read about will be there,” Katz said. “It’s a unique opportunity that will help my plans to go to graduate school.” As practice, Katz presented at the annual Butler Undergraduate Research conference in April. 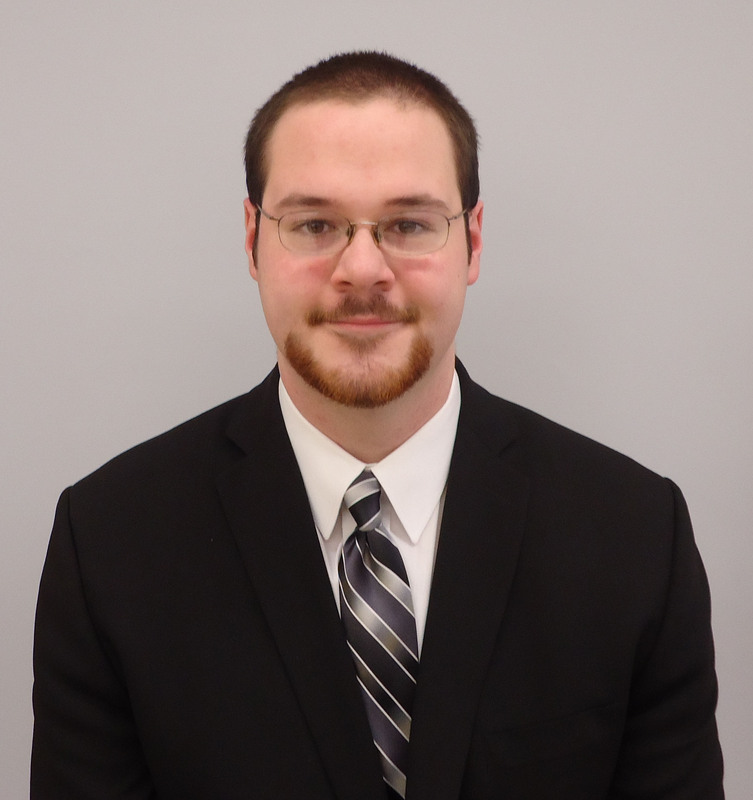 He was chosen to participate in more research during Butler Summer Institute 2014. “Ian made some important suggestions and tweaks on the research, so we thought it would be appropriate for him to be second presenter with Chris,” said O’Malley. 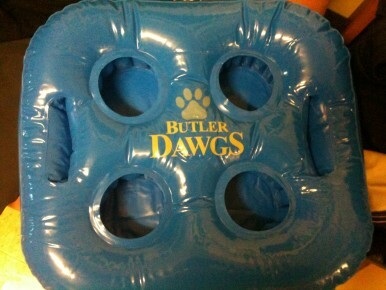 Being encouraged to attend conferences is a way Butler recognizes students “who make the greatest effort,” she added. Hamamouche speaks with awe in her voice when she recalls a previous APS conference where she met Beth Loftus, a noted expert in human memory. O’Malley was a Butler senior when she attended the 2004 APS conference, and presented a poster on research she conducted with Professor, now Provost, Kate Morris. But, O’Malley’s conference highlight was an elevator ride she shared with Albert Bandura, a leading scholar on social learning and aggression. Since joining the psychology faculty, O’Malley said, she has noticed a shift in departmental thinking from her own student days. “We get more students involved in research earlier,” she said. In recent years, close to two-thirds of all Butler psychology graduates have gone on to graduate or medical school. Presenting at major conferences as students offers them an advantage in applying to those programs, Dale said. Hamamouche, who begins graduate studies in developmental psychology at Boston College this fall, said her research and conference experiences definitely impressed those reviewing her application to the graduate program. They also came in handy during an internship she completed last summer at Johns Hopkins, during which she and other undergraduate interns were required to develop and present posters. 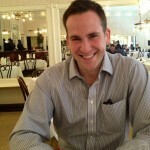 Graduating journalism major Ryan Lovelace ’14 has been awarded a William F. Buckley Fellowship in Political Journalism. As part of the fellowship, Lovelace will work in the editorial department of National Review magazine in New York for a year. Lovelace and Ian Tuttle from St. John’s College in Annapolis, Maryland, were chosen because of their passion for journalism and a steadfast commitment to conservative principles, the National Review Institute said in a news release. 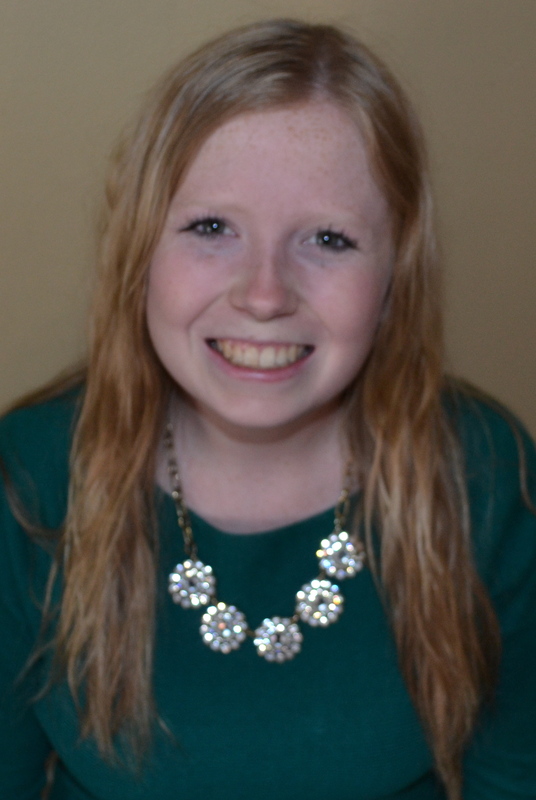 Lovelace, a senior from North Aurora, Illinois, has served as managing editor of The Butler Collegian in 2013-2014. In early April, he won a national award from the organization Investigative Reporters & Editors for the story “A Center and Its Director,” about the University’s creation of the Desmond Tutu Center and its hiring of Allan Boesak to be the first director. In a three-month investigation, Lovelace used South African court records, documents from Wikileaks, and interviews with sources in South Africa to document Boesak’s history. The former freedom fighter had been convicted of misusing donations made to his foundation. National Review roving correspondent Kevin D. Williamson will serve as onsite mentor for the fellows, offering editorial feedback, guidance, and support in weekly reviews and hosting them in monthly lunches with leading conservative thinkers and journalists. The Buckley Fellowship is named for William F. Buckley Jr., who nurtured two generations of conservative journalists. His legacy includes scores of conservative editors and writers. The first Buckley Fellow, Robert Costa, is currently a national political reporter for The Washington Post. Thanks to a $30,000 grant from the Butler Innovation Fund, students in the Chemistry Department have partnered with the Center for Urban Ecology (CUE) to convert waste cooking oil into biodiesel fuel. This student-led initiative seeks to recycle vegetable oil waste from the Marketplace at Atherton Union and convert the oil to biodiesel fuel that can be burned by various vehicles and equipment currently utilized by the Facilities Department. At the Butler conversion facility, approximately 50 gallons of vegetable oil will yield a range of 40-45 gallons of biodiesel. “First and foremost, the initiative aids the University’s mission to reduce its carbon footprint because the fuel will be implemented into the campus fleet,” said Kyle Graden, biodiesel intern at the Center for Urban Ecology and one of eight student leaders involved in this project. The initiative’s initial stages began last November, as students involved in this project made it their goal to reduce Butler’s contribution to air pollution. Many of the preliminary efforts made by the group were spent determining the proper way to work the machinery. Students also wrote safety protocol documents, an instruction manual, and contacted the American Society for Testing and Materials (ASTM) to become certified to produce the fuel. After producing an initial 50-gallon test batch in December, the students have created one additional batch of biodiesel thus far. 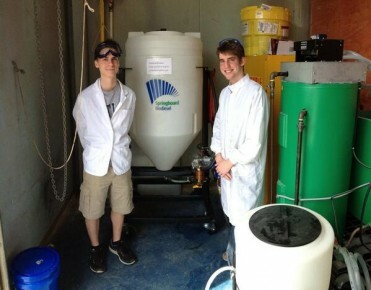 The resulting biodiesel is then blended with actual diesel fuel for use in the campus vehicles. In the short term, the biodiesel team hopes to establish a regular schedule for fuel production. The majority of its efforts will be focused on using the processing equipment to manufacture the fuel for the Facilities Department. A long-term goal for the initiative, pending legal approval, is to sell excess supply of the biodiesel to local businesses and the Indianapolis community at a competitive price. According to McKenzie Beverage, Butler’s Sustainability Coordinator, the University is a national leader among universities in terms of biodiesel production. Butler is the first higher education institution in Indiana—and one of only a handful in the United States—to take on a student-driven alternative fuel initiative. “Projects like this are very beneficial for college campuses to partake in for a number of reasons,” said Graden. “The project is student run, which allows participants to combine concern for the environment with an economically efficient model. 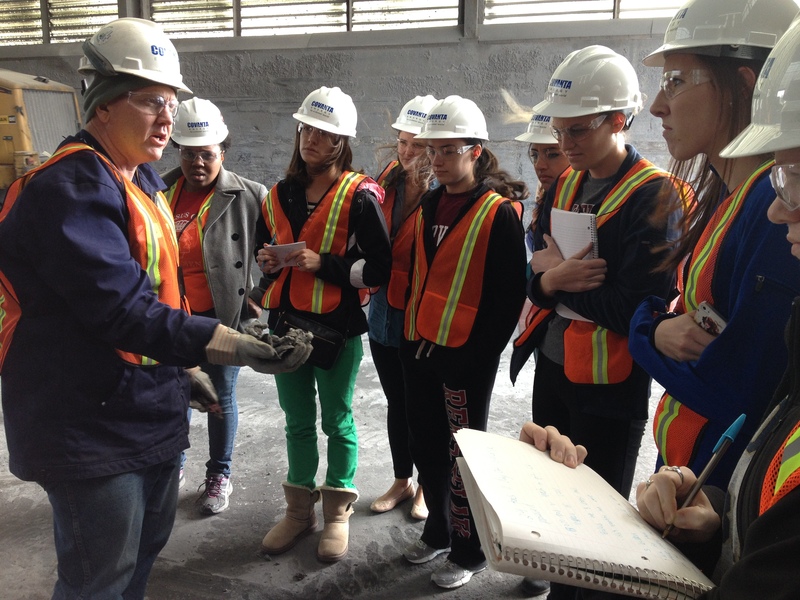 The biodiesel interns will be offering tours of their production facility on Earth Day, April 22. Those interested can sign up via this link: https://docs.google.com/forms/d/1SXgJakv8o1f5-A0nFhrsViRAwcmLNhibegjCvk9WyAM/viewform. For more information about the initiative, the students involved in the project run a blog, as well as Facebook and Twitter accounts. Digging through trash is McKenzie Beverage’s idea of fun, and on Thursday she couldn’t have been happier. For two hours on April 17, Beverage and her students in the Butler Sustainability Practicum class sifted through nearly a ton of trash – 660 pounds from Ross Hall and another 1,140 pounds from Atherton Union – poured from Dumpsters onto the west mall between Jordan Hall and the Pharmacy Building. Their goal: to see how many pounds of recyclables and food waste are thrown in the garbage on an average day. Of that 1,800 pounds, 600 was recyclable—plastic water bottles, aluminum cans, glass bottles, and Starbucks cups—and 600 was food waste. Her goal now is to change where we are. Using the results, she and the campus sustainability council will create educational materials about proper waste disposal and work to make recycling on campus even easier. As for the waste they looked through, the actual garbage was sent to the southside Indianapolis incinerator where it would normally go. So did the food waste, because Butler doesn’t compost discarded food. Yet. The recyclable material was recycled. Beverage said the experience was great. 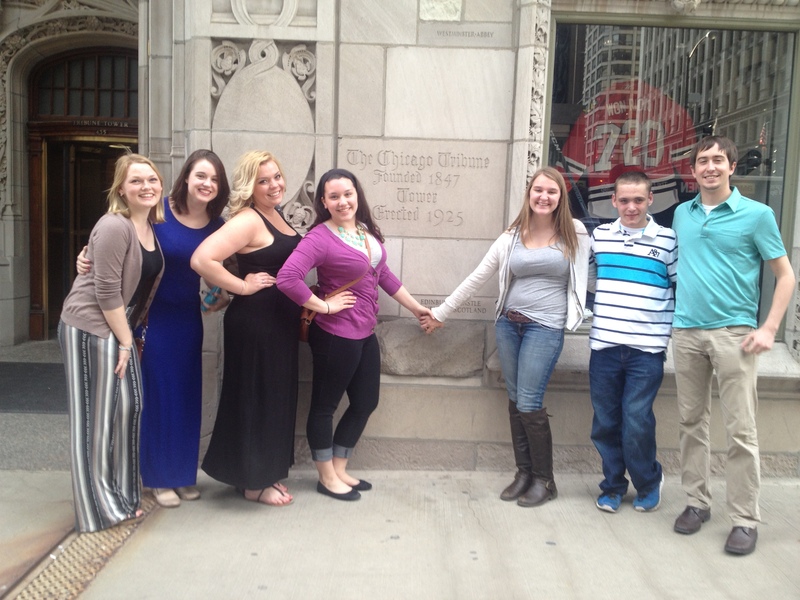 The Butler Collegian had three winners and three finalists in the small newspapers category at the Society of Professional Journalists Region 5 awards banquet April 12 in Chicago. From left: Maggie Monson, copy desk chief and opinion columnist; Mallory Duncan, Arts, Etc. assistant editor; Marais Jacon-Duffy, news editor; Katie Goodrich and Natalie Smith, assistant news editors; Matthew VanTryon, assistant sports editor; Colin Likas, editor in chief. The three winners go on to compete in the national competition against 11 other SPJ region winners. Colin Likas, general news reporting, for "Red Ink," which ran in the Oct. 16, 2013, Collegian. Maggie Monson, opinion column, for "You don't have to look sick to be sick," Nov. 6, 2013. 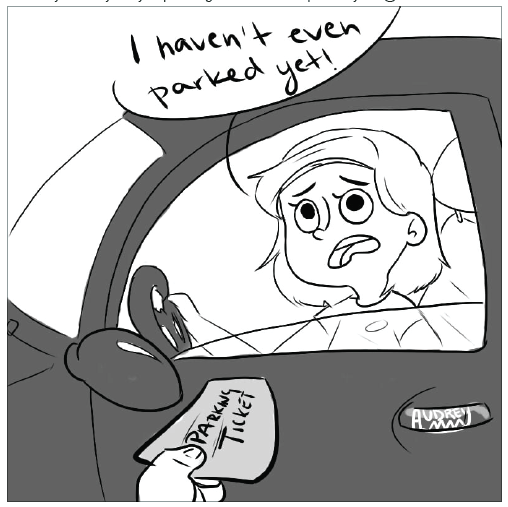 Audrey Meyer, editorial cartooning, for "Parking Ticket." Marais Jacon-Duffy and Taylor Meador, breaking news, for "Butler mourns America's dog," Sept. 24, 2013. Adam Winay, general news reporting, for "$14,738,745 and no one's talking about where it's going," April 24, 2013. Kyle Beery, sports reporting, for "Barlow desires to coach after playing days," March 6, 2013. The region includes collegiate newspapers from Illinois, Indiana and Kentucky. Alex Still graduates in May with a bachelor’s in dance pedagogy and French, along with a history minor. And she’ll be using all she learned when she heads to France this fall as recipient of the Fulbright French Government Teaching Award, sponsored by the French ministry of education. Still, who came to Butler from Williamsburg, Virginia, will leave for France in mid-September and spend the school year teaching English to French middle and high school students in the northern France city of Lille. 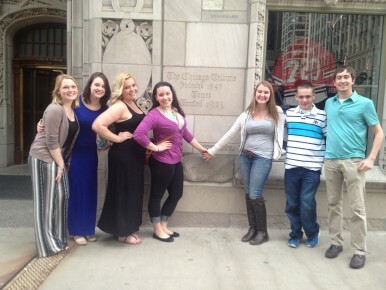 As a dance pedagogy major, Still took dance classes and participated in Butler Ballet performances. But she also took classes in anatomy, education, psychology, and teaching analysis of dance technique. “Diverse coursework,” she said. In October 2013, Still began the process of applying for the Fulbright, working with Rusty Jones of the Center for High Achievement and Scholarly Engagement. She received the good news on April 1. She is the third winner of this award in Butler's history, following Courtney Campbell (now Rousseau) in 2003 and Adam Weaver in 2011. Fulbright applicants for France are considered for both the Fulbright award and a separate, equally prestigious, award (the French Government Teaching Award) from the French Ministry of Education. It’s customary for undergraduate students to be given more consideration for the French Government Teaching Award, whereas graduate students tend to receive the Fulbright. For Still, the French Government Teaching Award means a return to France. 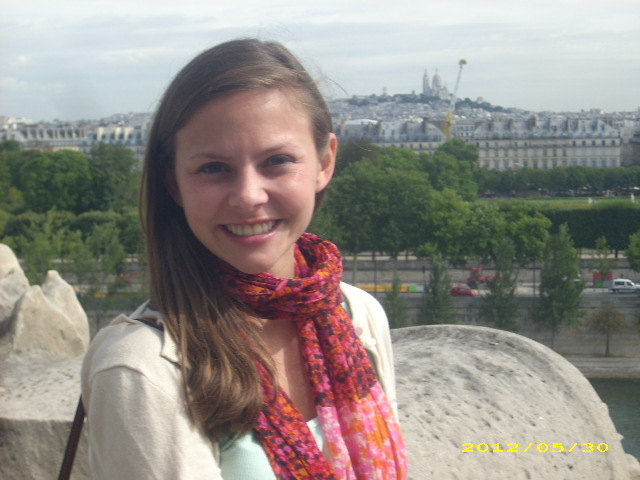 She studied in Dijon the summer after her sophomore year and also has visited Paris on a vacation. “I hope to stay over there for a few years at least,” she said. All applicants for the Fulbright are required to propose a side project that they will do in addition to teaching English. Still proposed bringing the concept of the Butler Community Arts School to France by volunteering in a school that needs arts instruction. So as part of her time in Lille, she will not only teach English but dance as well. “I want to share what I’ve learned through my dance education,” she said. Two Dumpsters’ worth of trash will be spilled onto Butler University’s west mall April 17 at 11:00 a.m. so students in the Sustainability Practicum course can gauge the amount of food and recyclables in a portion of the University’s garbage. Brian Foster, Environmental Manager for Covanta, Indianapolis's incinerator, explains the trash-burning process to Sustainability Practicum students. Ray’s Trash Service, which hauled Butler’s garbage, will overturn the receptacles, dumping out approximately 1,600 pounds of refuse collected from Atherton Union and Ross Hall, sites of the University’s two largest student dining halls. McKenzie Beverage, Butler’s Sustainability Coordinator and instructor for the Sustainability Practicum class, said the purpose of the exercise is to show the amounts of food that’s going to waste and recyclables that are ending up in the trash. “Because this is an awareness campaign, having a big pile of trash outside is very eye-opening and attention-getting,” Beverage said. Students will be tweeting their observations at #DawgsGoGreen14. The Twitter account name is @trashauditBU. An anthropology class will take the recyclables removed from this load of trash and use them for an art project. 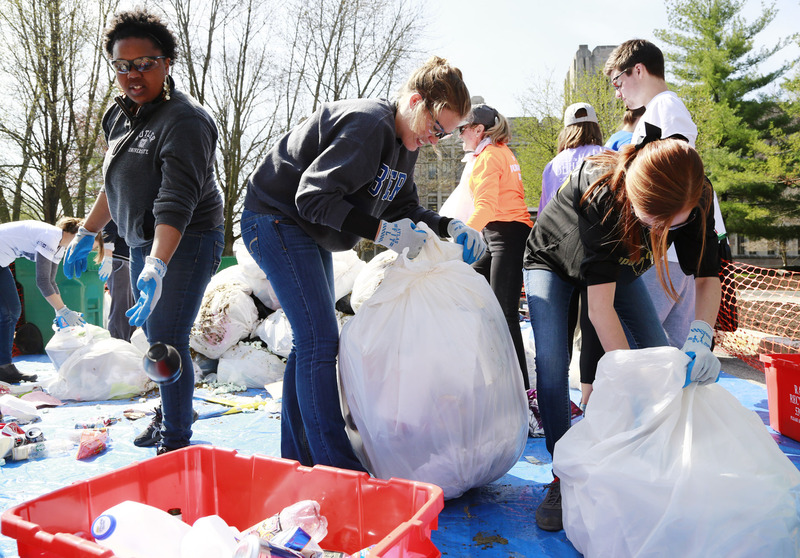 The trash audit is part of Earth Week events as well as a bigger initiative to raise awareness about waste and recycling among Butler students, faculty, staff, and visitors. -April 14-18: Food Waste Awareness in Dining Halls. Students from Beverage’s class will display pre-consumer food waste totals in the dining halls as an awareness tactic about food waste. Food waste accounts for 10 percent of landfill content in Indiana, a large source of greenhouse gas emissions. Butler Dining Services has reduced its pre-consumer food waste by 18 percent since April 2013, and continues to explore reduction tactics. -April 16: Jim Poyser from Earth Charter IN will host the “Ain’t Too Late Show” at 7:00 p.m. in Pharmacy Building Room 150. Collection bins will be provided to help support the Movers for Moms initiative. -April 19: Student Government Association’s Green Ops will coordinate a White River clean-up in cooperation with the Health and Recreation Center, Friends of the White River, Keep Indianapolis Beautiful, and the International School of Indianapolis. From 9:00 a.m. to noon, Butler students will clean up litter via canoe along the river between Rocky Ripple and the International School. -April 22-28: Move-Out Recycling Competition for Butler Seniors. Seniors preparing to move out of their houses can contribute unwanted but recyclable items for free, diverting those cast-off materials from landfills. In February and March, Butler participated in RecycleMania, an eight-week national competition between universities to promote waste reduction and recycling. In late March, a student group from the Sustainability Practicum class created a Greek house competition to help RecycleMania efforts. They collected 1,250 pounds of recyclables from seven Greek houses in a two-week period. -Submission of the University’s sustainability and climate action plan, part of the American College & University Presidents’ Climate Commitment that President James M. Danko signed in 2012. - The student-run initiative Butler Biodiesel has made its first batch of biodiesel fuel from waste cooking oils generated on campus with new equipment funded by the Butler Innovation Fund. The group plans to give the biodiesel away on a first-come, first-served basis this summer. -Butler College of Business Real Business Experience students have started a recycling company called Green U to service Greek houses and Butler senior houses at a subsidized rate. The Butler Collegian won 11 awards at the Indiana Collegiate Press Association's annual conference Saturday at IUPUI, celebrating the best of Indiana's collegiate newspapers, news magazines, literary magazines, yearbooks, online publications and advertising. Cartoonist Audrey Meyer, news editor Marais Jacon-Duffy, managing editor Ryan Lovelace, sports reporter Joe Hasenstab and assistant sports editor Matthew VanTryon display the Collegian's awards. Sophomore Mallory Duncan, who is assistant editor of the Arts, Etc. section, received first place for best entertainment feature story, "A Glorious Adventure Awaits," about science fiction/fantasy writer and Butler senior Stefan LeBlanc. The judge called the story "a great student profile." Sophomore Audrey Meyer won first place for best editorial cartoon for "Parking Ticket." The judge wrote: "Made us laugh. Clearly and quickly gets the idea across, with a great facial expression. The cartoonist has a very bright future in cartooning." The Collegian won first place for best special issue on March 20, 2013, with the lead stories, "Butler Joining the Big East" and "Back in the Big Dance." It was published the week after spring break (when a newspaper is not normally published), put together under deadline by six students: Jill McCarter '13, Colin Likas, Marissa Johnson '13, Austin Monteith, Lauren Stark and Madison Chartier. The judge wrote: "Great way to capitalize on big sports news by centering an issue around it." The Collegian also received first and second place for best sports page: "Cycling Team Keeps Rolling," from Oct. 16, 2013, by Taylor Meador '13, Austin Monteith, Kyle Beery and Ben Sieck, and "Official Reaction," from March 6, 2013, by Johnson and Monteith. --Best non-deadline news story, "Packing Up and Moving On," March 6, 2013, by McCarter, Likas and Johnson. --Best single issue, March 6, 2013. --Best front page, October 16, 2013, "Red Ink." --Maggie Monson, best opinion column, for "You Don't Have to Look Sick to Feel Sick." In addition to those awards, The Collegian placed third for best Division II Newspaper of the Year. 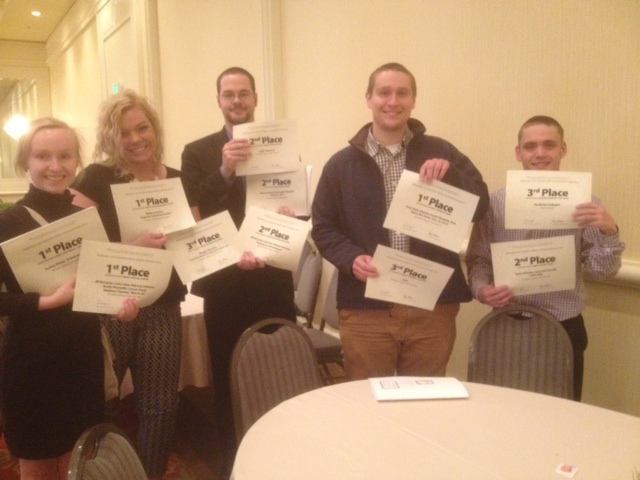 Winners this year were The Shield at the University of Southern Indiana, and The Reflector at the University of Indianapolis, respectively. The Collegian had won the category the past two consecutive years. Emily Seibert ’14 received her best 22nd birthday present the day before her actual March 27 birthday: She was chosen for a prestigious Fulbright English Teaching Assistantship to live and work in Athens, Greece, for 10 months. She’ll leave in September and be one of a dozen Americans in the Fulbright program who will teach English and American culture to students at the elementary, middle and high school levels. Seibert, an elementary education major from Valparaiso, Indiana, said she had planned to start the job-search process in Indianapolis for a teaching position at the elementary-school level. Then she saw a notice in the Butler Connection—the daily email that goes to students, faculty, and staff—about applying for a Fulbright. “It put together three of the passions I’ve enhanced at Butler; my love for teaching and my love for kids, my passion for serving others and my new-found love of experiencing different cultures found through my study abroad experience,” she said. She talked to Rusty Jones, Interim Associate Director of Butler’s Center for High Achievement and Scholarly Engagement, and he helped her start the application process and edit her essays. Jones also organized a Fulbright campus committee interview and wrote her institutional endorsement. The opportunity to participate in the program in Greece thrilled her because it has no requirement that participants speak a foreign language fluently (Seibert doesn’t) and because she’ll be there with other Fulbright recipients, working collaboratively. Kurt Carlson, a graduate student in music history in Butler’s Jordan College of the Arts, has received a Fulbright award for 2013-2014 to conduct research in Austria, through the University of Vienna, on 18th century composer Paul Wranitzky and the First Viennese School. Carlson’s work will include searching for Wranitzky’s letters in the many archives in Vienna, as well as the Masonic archives at Schloss Rosenau and some of the Czech holdings in Prague. He also will attempt to produce some new critical editions of Wranitzky's symphonies, especially those that have yet to been performed. “I hope that after this research and time spent working on the same project for a dissertation I will have enough new information to write the first definitive monograph on Paul Wranitzky,” said Carlson, who also will be teaching in a secondary school un Vienna during his year there. Carlson said he became interested in Wranitzky when, pondering a topic for an undergraduate thesis, he decided to trace how certain composers reacted to the cultural and political climate of their given moment in history. He settled on two scenes: a "reactionary parenthesis" regarding WWII through selections by Shostakovich and Schoenberg, and a journey into the parallel idealist and realistic tendencies of the political fallout after the French Revolution, illuminated by Beethoven's Third Symphony (1803-1804), and Paul Wranitzky's Op. 31 Grande Sinfonie Caracteristique pour la Paix avec la Republique Francoise, often referred to as La Paix. Carlson, a native of Woodstock, Ill., earned his undergraduate degree from Monmouth College. His primary advisors at Butler are Professors Sarah Eyerly and James Briscoe. He plans to enroll in a doctoral program when he returns from his year in Vienna. "We are so proud that Kurt has received this award,” Eyerly said. “This is an honor for our department and for the University. And for Kurt, the Fulbright will likely constitute a career-changing experience. It shows the promise for Kurt to rise to the top of our profession and will enable him to demonstrate this promise in a tangible way to prospective graduate schools upon his return to the U.S."
The Fulbright program, sponsored by the U.S. government, is designed to “increase mutual understanding between the people of the United States and the people of other countries.” Through the program, nearly 300,000 participants — chosen for their academic merit and leadership potential — have been given the opportunity to study, teach and conduct research, exchange ideas and contribute to finding solutions to shared international concerns.